But after listening to the entire forum, one thought keeps resounding in my mind: The practical and the philosophical are intertwined. I agree with Moffit that this is one of the great debates in American history, but it has a lot in common with other debates we’ve had. Who should allocate resources (in this case, in our health care system)? As James Capretta pointed out, ObamaCare starts with the presumption that the government will do it. This presumption is not only anti-American in theory, but also disastrous in practice. 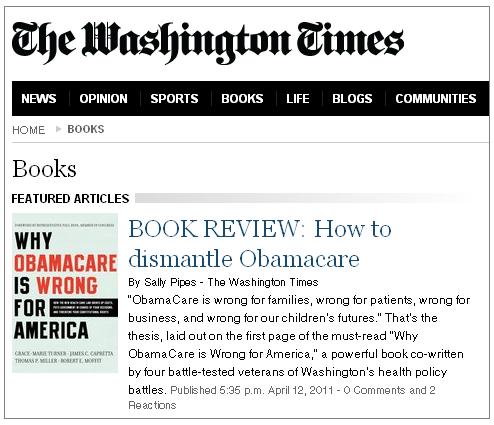 In Why ObamaCare is Wrong for America, the authors…explain exactly what the law stipulates and how the law will affect each of us: as patients, as employees, as taxpayers, and as citizens. They also lay out a plan for reforming the law so we can get health care right. Earlier this week, co-author James C. Capretta gave an interview to Newsmax.TV about Why ObamaCare Is Wrong for America, rationing, and hidden aspects of the health overhaul law. Read a summary of the interview on Newsmax, and watch the video clip below. Visit The Foundry to read the full interview.